O R I G I NAT I O N S E R V I C I N G A NA LY T I C S S E C O N DA R Y M A R K E T ORIGINATION THE LATEST Origination Credit Quality Lowers Mortgage Delinquency Rates Mortgage delinquencies have fallen from a peak of 7 percent in 2010 to less than 3 percent. 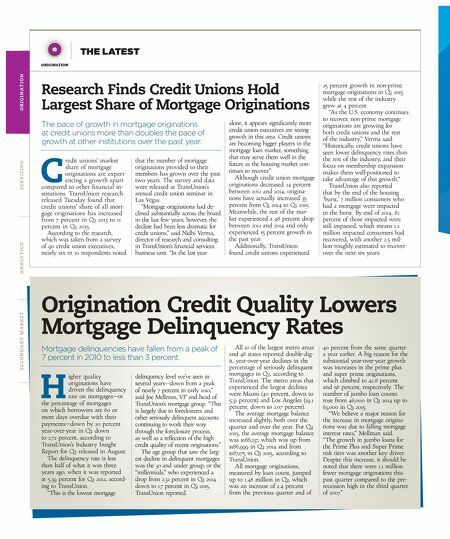 H igher quality originations have driven the delinquency rate on mortgages—or the percentage of mortgages on which borrowers are 60 or more days overdue with their payments—down by 20 percent year-over-year in Q2 down to 2.72 percent, according to TransUnion's Industry Insight Report for Q2 released in August. The delinquency rate is less than half of what it was three years ago, when it was reported at 5.39 percent for Q2 2012, accord - ing to TransUnion. "This is the lowest mortgage delinquency level we've seen in several years—down from a peak of nearly 7 percent in early 2010," said Joe Mellman, VP and head of TransUnion's mortgage group. "This is largely due to foreclosures and other seriously delinquent accounts continuing to work their way through the foreclosure process, as well as a reflection of the high credit quality of recent originations." The age group that saw the larg - est decline in delinquent mortgages was the 30 and under group, or the "millennials," who experienced a drop from 2.32 percent in Q2 2014 down to 1.7 percent in Q2 2015, TransUnion reported. All 10 of the largest metro areas and 48 states reported double-dig - it, year-over-year declines in the percentage of seriously delinquent mortgages in Q2, according to TransUnion. The metro areas that experienced the largest declines were Miami (40 percent, down to 5.31 percent) and Los Angeles (29.1 percent, down to 2.07 percent). The average mortgage balance increased slightly, both over the quarter and over the year. For Q2 2015, the average mortgage balance was $188,237, which was up from $186,999 in Q2 2014 and from $187,175 in Q1 2015, according to TransUnion. All mortgage originations, measured by loan count, jumped up to 1.48 million in Q2, which was an increase of 2.4 percent from the previous quarter and of 40 percent from the same quarter a year earlier. A big reason for the substantial year-over-year growth was increases in the prime plus and super prime originations, which climbed to 42.8 percent and 56 percent, respectively. The number of jumbo loan counts rose from 46,000 in Q1 2014 up to 63,000 in Q1 2015. "We believe a major reason for the increase in mortgage origina - tions was due to falling mortgage interest rates," Mellman said. "The growth in jumbo loans for the Prime Plus and Super Prime risk tiers was another key driver. Despite this increase, it should be noted that there were 1.1 million fewer mortgage originations this past quarter compared to the pre- recession high in the third quarter of 2007." Research Finds Credit Unions Hold Largest Share of Mortgage Originations The pace of growth in mortgage originations at credit unions more than doubles the pace of growth at other institutions over the past year. C redit unions' market share of mortgage originations are experi- encing a growth spurt compared to other financial in- stitutions. TransUnion research released Tuesday found that credit unions' share of all mort- gage originations has increased from 7 percent in Q1 2013 to 11 percent in Q1 2015. According to the research, which was taken from a survey of 90 credit union executives, nearly six in 10 respondents noted that the number of mortgage originations provided to their members has grown over the past two years. The survey and data were released at TransUnion's annual credit union seminar in Las Vegas. "Mortgage originations had de - clined substantially across the board in the last few years; however, the decline had been less dramatic for credit unions," said Nidhi Verma, director of research and consulting in TransUnion's financial services business unit. "In the last year alone, it appears significantly more credit union executives are seeing growth in this area. Credit unions are becoming bigger players in the mortgage loan market, something that may serve them well in the future as the housing market con - tinues to recover." Although credit union mortgage originations decreased 24 percent between 2012 and 2014, origina- tions have actually increased 35 percent from Q1 2014 to Q1 2015. Meanwhile, the rest of the mar- ket experienced a 48 percent drop between 2012 and 2014 and only experienced 15 percent growth in the past year. 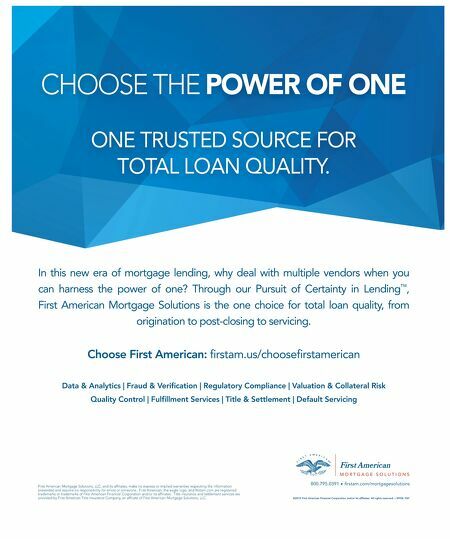 Additionally, TransUnion found credit unions experienced 25 percent growth in non-prime mortgage originations in Q1 2015 while the rest of the industry grew at 4 percent. "As the U.S. economy continues to recover, non-prime mortgage originations are growing for both credit unions and the rest of the industry," Verma said. "Historically, credit unions have seen lower delinquency rates than the rest of the industry, and their focus on membership expansion makes them well-positioned to take advantage of this growth." TransUnion also reported that by the end of the housing 'burst,' 7 million consumers who had a mortgage were impacted in the burst. By end of 2014, 82 percent of those impacted were still impacted, which means 1.2 million impacted consumers had recovered, with another 2.5 mil- lion roughly estimated to recover over the next six years.